Practical RPG accessories loved by players around the world! 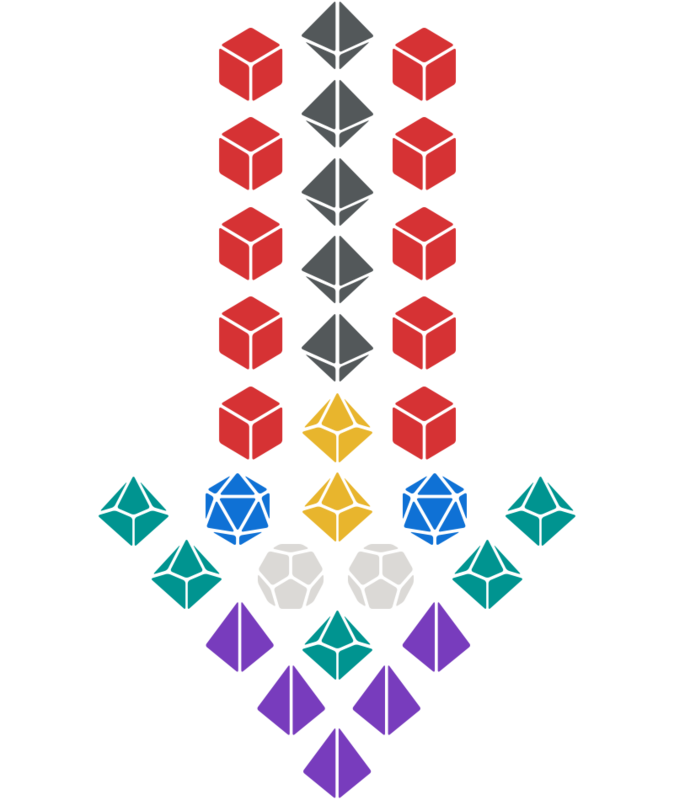 Dice of Rolling – a complete set of polyhedral dice featuring optimized quantities for 5th edition and color-coding by type. Roll fireballs in one throw, and grab the right dice every time! Battle Tokens – a set of attractive hardwood game pieces that deliver an absurd amount of utility in a small package. It's like having an army of miniatures in your pocket! Dice of Rolling made their debut on Kickstarter in 2017 and were so popular they got funded in a single day! The set is color-coded by type and includes the quantities you actually need for routine gameplay in 5th edition. Great for hurtling a classic Magic Missile spell, and also for a handful of other spells like Acid Arrow and Vicious Mockery. We believe in one simple principle: rolling a Fireball should feel like a fistful of fiery d6 magnificently hitting the table all at once. You'll be rolling several d8 for plenty of spells like Sleep, Shatter, Chromatic Orb, and even the Paladin's Divine Smite. Used for spells like Fire Bolt and Inflict Wounds, you won't need a lot of d10 early on. They'll come into play more at higher levels. Mainly used for weapon attacks and high level Bardic Inspiration, you'll only need a couple d12. So why have more? Ah, the good old d20. Having a couple of them is great for rolling with advantage or for rolling multiple attacks at once. Mainly used for loot or randomized effects, a matching d10 and d% are rolled together to generate a number from 1 to 100. You'll need something to hold all those dice, so we include a sturdy microfiber bag. It's large enough to hold up to 2 full sets. Does my class need them? Classes that are able to cast spells will get the most use out of Dice of Rolling. If you only ever play a Barbarian, you'll do just fine with a regular set of dice. Some classes that don't cast spells can still benefit to a limited degree—such as Rogues due to their Sneak Attack requiring a lot of d6 at higher levels. New players will also benefit regardless of their class, due to all the dice being color-coded. Don't some spells use more dice? We’ve designed this set to handle the majority of dice rolls in one throw (no consecutive rolling), but a few spells still use more dice. If you really want to be able to roll the full amount of dice for Meteor Swarm and other high level spells and abilities, we have an easy solution: just buy two sets and double them up. Yes we do! Before ordering internationally though, make sure you're familiar with your country's duties and fees for importing items from the USA. The rules are different for every country, and we don't want you to be surprised by any unexpected charges! Enough Talk. Bring me Dice! Originally designed for the games we play over our lunch breaks, Battle Tokens fit in a pocket but work for any encounter. Symbols are used to keep things flexible, allowing the same token to be used in a variety of different situations. For players & unique NPCs. Or use as more enemies. In a survey of all our Kickstarter backers, the vast majority rated us 10 out of 10. This is just a fraction of what they had to say. The dice are really well made, they have exceeded my expectations, and the color system is genius. One of the fastest ways at teaching new players and having them remember which dice to use. Absolutely fantastic for having new players at my table or being a spellcaster!!! I have two sets and love them!!! The quality is wonderful. I am very pleased with this product. They have become my #1 set in only a few sessions. Made playing a caster of any sort IMPOSSIBLY easier! Join the thousands of RPG players from around the world who've signed up for our email list, plus get free stuff! 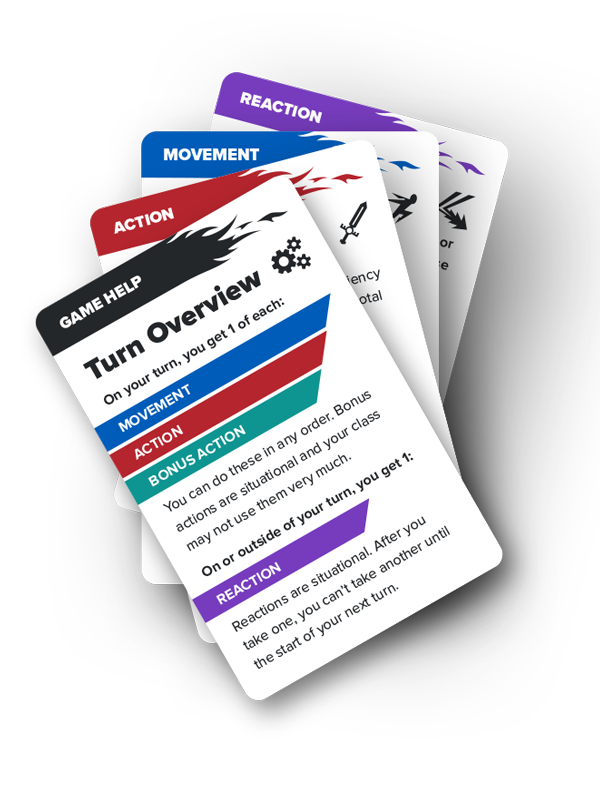 This printable card set makes 5th edition rules a snap to learn! Fits in trading card sleeves. 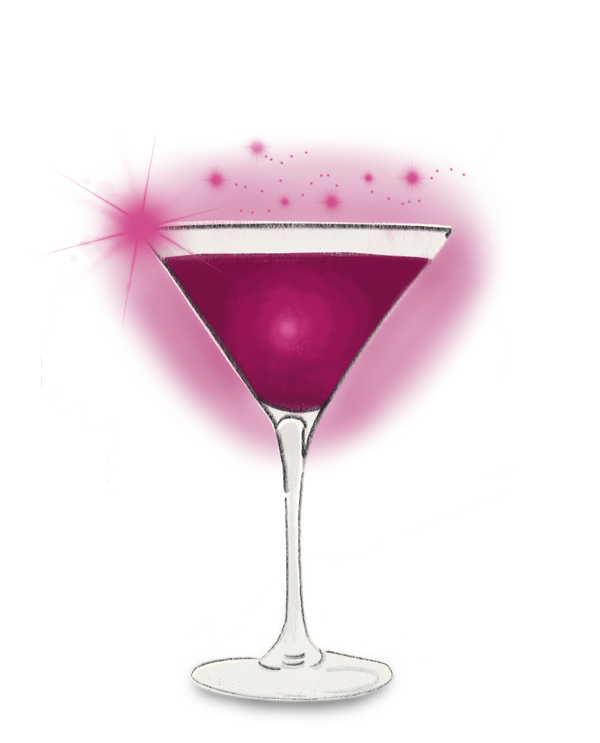 A guide to mixing 20 RPG-themed drinks with in-game effects for 5th edition. Alcohol not included. 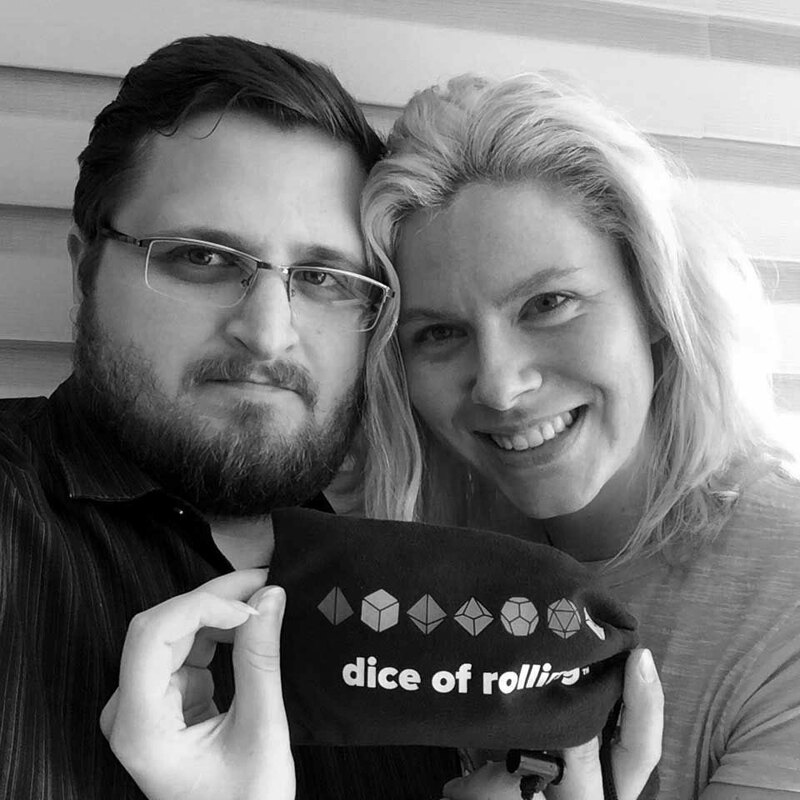 Jon and Keni Hill are a husband-and-wife nerd team who can usually be found playing an embarrassing number of tabletop campaigns at any given time. Keni also plays in the Save or Dice "Fury" campaign on YouTube, and streams non-tabletop content on Twitch. We also just launched streambingo.tv, a web app that lets streamers turn their content into a game of bingo for viewers. You can even bingofy your D&D games! Is it legal to use 5e rules? All other claims of compatibility are NOT made under the terms of the OGL, and are instead made lawfully under the terms of normal intellectual property law. Copyright © Dice of Rolling, All rights reserved.